These two white mountaineering ungulates (hooved animals) have many characteristics in common and both frequent steep rocky terrain. With a little practice, however, you can easily tell a Dall sheep (Ovis dalli dalli) from a mountain goat (Oreamnow americanus). Both animals (male and female) have horns, but mountain goat horns are black, sharp, and slightly curved while Dall sheep horns are lighter in color and, among the males, are massive and may curl into full circles. Mountain goat coats are more yellowish in color, they are more square in appearance, and less broad-chested than Dall sheep. Their hair, especially in winter, is much longer and they have a distinct “beard” under the chin. Both goats and sheep rely on their agility and strength to clamber through the steep, rocky terrain that is protection from predators. Both will graze and rest on moderate slopes to keep an escape route to higher ground. Dall sheep are closely related to bighorn sheep and are part of the genus that includes the domestic sheep. Mountain goats are only distantly related to domestic goats. Like mountain goat nannies, Dall sheep ewes flock in spring to rugged “nursery cliffs.” Here, their young gain strength and agility and the danger of a fall is trumped by the protection from predators. Male sheep, or rams, form their own groups that travel together, meeting up with ewes only in mating season. Billies travel solo or in bachelor groups of a half-dozen animals. 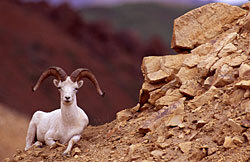 Dall sheep tend to prefer drier south-facing slopes. In winter, they move to windswept areas where the snow does not drift too deep and they can reach the dry grasses and sedges that make up their winter diet. Goats tolerate deeper snows on the wetter north-facing slopes. In winter, they head down the mountains to the protection of the high forests, where they feed on rough forage such as mountain hemlock and blueberry bushes. Look for moving spots of off-white on mountainsides and steep craggy cliffs. Dall sheep inhabit all the mountain ranges of Alaska. Mountain goats occur throughout the southeast Panhandle and continue north and west along the coastal mountains to Cook Inlet. In Southcentral Alaska, goats are mostly confined to the Chugach and Wrangell mountains. They were introduced to non-native ranges including Kodiak Island and Revillagigedo and Baranof islands in Southeast. They were reintroduced on Mt. Juneau in 1989 but did not become a common sight there until the early 2000s.